One of the more shadowy figures at Sun, Smokey Joe Baugh was around the Memphis music scene from an early stage. Born in Helena, AK, he embarked on a musical career in 1947 working as a pianist in Memphis and West Memphis. Around 1952 he joined the Shelby Follin Band, and for a few months he and bandmate Paul Burlison performed with Howlin' Wolf on radio KWEM in West Memphis, Arkansas. 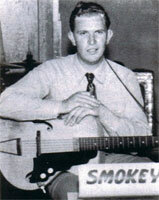 Subsequently he joined Clyde Leoppard's Snearly Ranch Boys, with whom he recorded, appeared on local radio and toured with many of the Sun package tours. The record they made for Sam Phillips was "Split Personality"/"Lonely Sweetheart" (Flip 502), released in the spring of 1955. On the A-side, credit goes to "Bill Taylor & Smokey Jo" (in capitals), "Clyde Leoppard's Snearly Ranch Boys" (in smaller print). Baugh had a gravelly voice which was the result of a natural condition, rather than a conscious attempt to sound black. 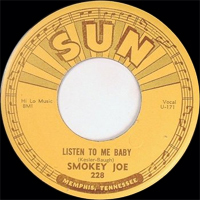 He cut four sessions for Sun as Smokey Joe in 1955-56 and had one single released, "The Signifying Monkey"/"Listen To Me Baby" (Sun 228, also released as Flip 228). 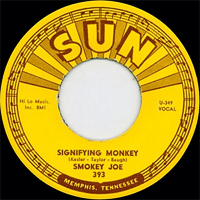 "The Signifying Monkey" was recorded on August 25, 1955, and its lyrics have a long history in black music. In fact, the story is such a central part of black culture that an entire book has been written on the subject : "The Signifying Monkey : A Theory of African-American Literary Criticism", by Henry Louis Gates (New York : Oxford University Press, 1989). (For a review of the book see: http://www-english.tamu.edu/pers/fac/myers/signifying.html ). 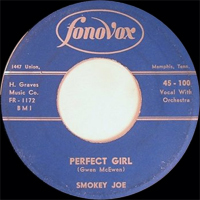 Hundreds of versions of the song have been recorded, among them a version by Chuck Berry, "Jo Jo Gunne" (Chess 1709, 1958). 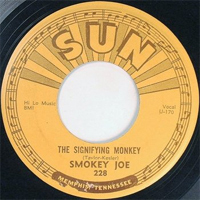 With Johnny Bernero on drums, Smokey Joe's "Signifying Monkey" was assured of a fine shuffle rhythm, and it enjoyed some local chart action after its release in mid-September 1955. 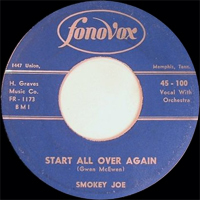 Sales were strongest in black markets that had no idea Smokey Joe was very blond and very white. This confusion reached its zenith when Joe was invited to perform at New York's Apollo Theatre in Harlem. 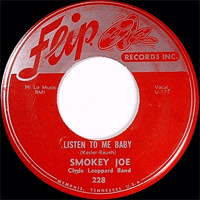 The flipside "Listen To Me Baby" is a solid outing in the jump blues mode (with a powerful piano solo) that did little to dispel the notion that Smokey Joe was black. 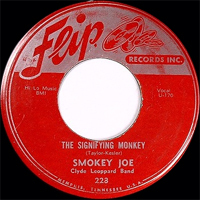 Surprisingly, "The Signifying Monkey"/"Listen To Me Baby" was reissued on Sun 393 in May 1964. Two factors might have led Sun to dust it off. First Sam the Sham had recorded it (this was pre-Woolly Bully, but it was a local hit) and second, it had a prototypical ska beat, popularized at that time by Millie Small's "My Boy Lollipop". 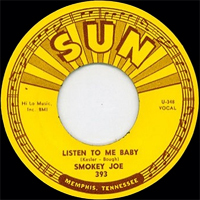 Other songs recorded at Sun were "She's A Woman" (three versions), "Hula Bop" (two versions, recorded at the same session as "Signifying Monkey"), "The Midnight Ride of Paul Revere" and two songs that are still unissued, "Only You" and "Tell It Like It Is". "Hula Bop" - the first Hawaiian bop record, predating Buddy Knox by a couple of years - was not released by Phillips at the time, and Jimmy Knight, a member of the Snearly Ranch Boys, profited by recording a version of it on Crystal in 1956. There is also a mysterious 45 by Baugh on the Fonovox label, "Perfect Girl'/"Start All Over Again". As a session pianist, Baugh can be heard on the tracks from the first Barbara Pittman session from April 1956 (I Need A Man, Sentimental Fool, No Matter Who's To Blame).